All day yesterday I felt stuck. I couldn’t write, or at least the words were as fluid as raspberry jam, vibrant, yet chunky. I know exactly why I was in the funk of all funks, it wasn’t the close proximity to Christmas, a time when typically my anxiety overwhelms every cell in my body. Miraculously, I am actually excited about Christmas this year. Well, I am excited about it as much as a prisoner is excited about their government issued cheese and ham prepared lunch meal I once saw in person during a “Scared Straight” presentation in a high school psychology class; I know I need to choke it down in order to survive, but I am not looking forward to it. Okay, yes, my inevitable Scroogyness was part of my gloomy mood, (cue the clichéd child of divorce/parent of a child of divorce agony that I have never been able to outrun during this festive/excruciating time of year), but my Afterschool Special reality wasn’t really the main culprit behind my melancholy Monday mood of doom and gloom. The real reason I felt so “off” yesterday was because I couldn’t move. Or, rather I was asked not to. 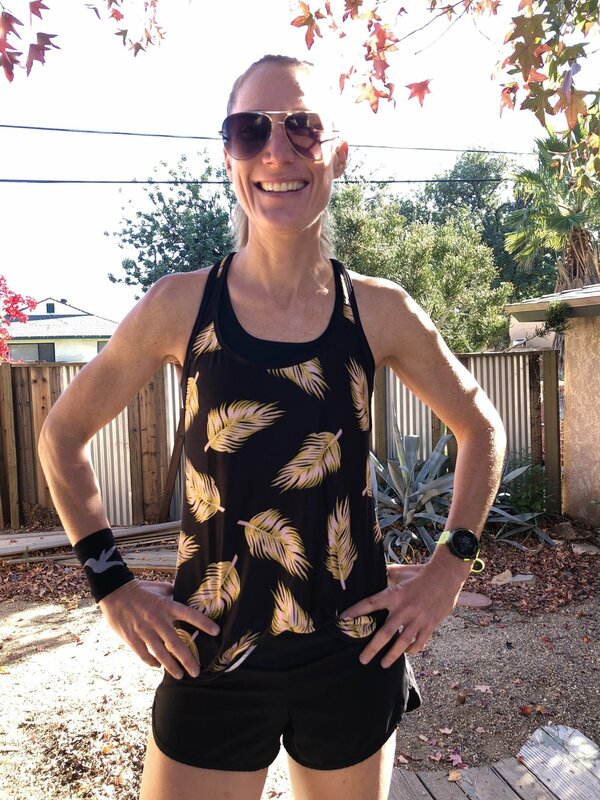 I volunteered for a study my friend and teammate Lynne turned me on to that entailed two days of Lactate Threshold and VO2 max testing within a ten-day period. A fantastic opportunity that I did not want to pass up, but there was a catch, every participant was asked not to train at all the day before testing. I had my first day of testing last Tuesday, and my second is today, which means yesterday I stretched, and that is about it. I know, I know, very melodramatic, but I find comfort in being aware of my triggers, and not perspiring for over a twenty-four hour period is one of them. I don’t need to run a marathon every day, or swim a gazillion yards, but I thrive on movement, something, so when I am tasked to rest when I have not completed any of those aforementioned activities, I get a little antsy. This expression caught in the midst of my Sunday TRX workout doubles as a visual depiction of how I felt ALL day Monday. On the other hand, and this is when it gets interesting, after I completed the swim and bike testing last Tuesday I ran one of my favorite treadmill workouts, and it was one of the most transcendent runs I have ever experienced. Yes, I do have a Dylan and Kelly-esque connection with the treadmill, an inexplicable bond that even a fetching set of fraternal twins from Minnesota could never comprehend, much less break, but this particular workout stood out among the best of the best. It might have been so wonderful because I hadn’t run on a treadmill for over a month, or because my adrenaline was jacked up already due to the super-slick environment of the swanky TriFit gym in Santa Monica where I completed the testing, or it was because my legs and lungs were beside themselves to finally be asked to run hard after what felt like months of sitting on the sidelines like Rudy, suited up and ready to play, but never being asked to get in the game. Finally, they got their shot. I am pretty sure my large, quick-moving frame and sweat-whipping ponytail frightened a few neighboring treadmill runners, a telltale a sign of a great workout. The rest of the week was peppered with solid swims, including a successful outing in a long course pool, and a Saturday morning dalliance in the ocean. Tall T lookin’ out toward the sea. Photo courtesy of Bryan Mineo. Plus, I took Simone out for a spin along the Bumpy Road, and finally executed a trainer workout that has eluded me for months, (or longer), but thankfully my new trainer rose to the challenge. Thank you, eBay. Then Sunday morning arrived, AKA, my Christmas. The run was amazing even though I did not nail the workout. I definitely looked and felt fabulous decked out my new Smashfest Queen GOLD running singlet and matching shorts, but I also felt my fitness grow with each pounding footfall, progress was coursing through my muscles and pores, which was both awesome and honest, because it was clear that I still have a ways to go. The next race I have on my schedule is the Surf City half marathon on Super bowl Sunday, a mere seven weeks away. Last year’s finish at the Surf City Half Marathon in Huntington Beach. Following that quick run-only romp are two half-iron distance triathlons in the spring, so grinding out workouts to gain my speed back is the current task at hand. Not only do I instinctively see the world through a marathon runner’s gaze, but also I have literally been training for that distance since early August, however that phase of familiarity is over. It is time to tap into my dormant Vista Speed and fire up my fast-twitch muscles; my next marathon isn’t until June. More post-workout photo shoot fun. Furthermore, I realize freaking out about forced stillness yesterday after a raucously fun and exasperating Sunday is silly. I accept that there was more stress behind my Monday anxiety, and that just maybe that extra rest will come in handy when I need it most. Or, the results from these tests will lend me the piece of the puzzle I need to push beyond where I’ve ever gone before in triathlon, a necessity to reach my goals for 2019. Meanwhile, I am simply thrilled for the chance to move today.